In the center of the mangteghapik [traditional house] there’s a pole—people call it aghveghaqetaq or tiiwri. A rope was tied from it to here, on top of the carving. You take hold of this and try to get it straight over for the one who is standing opposite you, to catch. Carvings of bowhead whales were used in Kamegtaaq, a thanksgiving ceremony held after the whaling season. The whale figure, with a tuft of reindeer hair to represent its spout, was hung above the seal oil lamp in a whaling captain’s house. Beginning with the captain, each man and a female partner swung the figure back and forth to each other across the burning lamp. Catching the whale carving reenacted the real hunt, which also requires the cooperation of women and men. Afterward each woman gave her partner a pair of new skin boots (kamek), from which the ceremony gets its name. Estelle Oozevaseuk: Kamegtaaq [carving of a whale or whale fluke used in a whaling ritual] is what they call it. The one that I saw—Dr. Collins had it—was very black, a very dark color. Whole families do that ceremony. In the center of the mangteghapik [traditional house] there’s a pole. (1) People call them aghveghaqetaq [wide pole in the center of the main entrance of a mangteghapik], but our term for that is tiiwri [another name for aghveghaqetaq]. A rope was tied [from top of pole] to here [top of carving]. You take hold of this try to get it straight over to the one who is standing opposite to catch. (2) Three times it goes that way, turns back, and goes that way and turns back until the whole family has been involved. Aron Crowell: That was part of getting ready for whaling or after a whale was caught. Estelle Oozevaseuk: After. They call it Kamegtaaq that ceremony. 1. According to St. Lawrence Island Yupik Elder Vera Kaneshiro, a mangteghapik [traditional house] is an above ground house with a driftwood frame, dome shape, female walrus skin cover anchored down with large rocks, and reindeer skins to separate corners into rooms. This term also refers to an older semisubterranean winter house. 2. According to Vera Kaneshiro, a kamegtaaq was made out of bone, ivory or wood. It was tied to the top of the aghveghaqetaq [wide pole in the center of the main entrance of mangteghapik] and swung to the four corners of the house without hitting the aghveghaqetaq when a whale was caught. Wooden carvings of bowhead whales were used in the St. Lawrence Island whaling ceremony called Kamegtaaq. (1) This one may have been made for sale, since carvings actually used in the ceremony were usually black from smoke and soot. 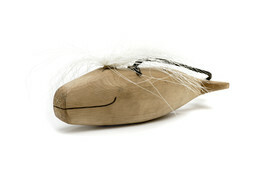 The tuft of reindeer hair represents the whale’s spout. Kamegtaaq [from kamek, “pair of skin boots”] was one of many traditional whaling ceremonies that were practiced until the early years of the 20th century. Today, the old ceremonies have been replaced by Christian prayers that are offered before, during, and after the hunt. Kamegtaaq was a thanksgiving ritual that took place after the whaling season. (4) The whale figurine was hung by a cord above the seal oil lamp in a whaling captain’s house. Beginning with the captain, each man and a female partner swung the whale back and forth to each other across the burning lamp. Catching the whale carving may have been a way of reenacting the real whale hunt, which also requires the cooperation of women and men. Afterwards, each woman gave her partner a pair of skin boots. On St. Lawrence Island, the partner was usually her husband, while in Yupik communities on the Siberian shore he would be another man of her clan. Ruby Rookok of Savoonga (born in 1911) remembered that, “We would hold back the dangling whale and release it to our partners across the room. When the whale got there, they would catch it. If the whale veered off course between them, [it was a sign that] someone had questionable health or life in the future. When the whale would swing toward our grandfather, Aghilluk, the whale would veer off course and he got frightened. Clans held other ceremonies when a whale was killed. (8) These lasted up to five days and included singing, story-telling, and prayers of thanksgiving. The wife of the whaleboat captain, dressed in a white snow shirt [sanightaaq “fancy gut parka”] and headband made of reindeer hair [qaghpa “ceremonial headdress”], played a central role. As part of the ritual, she symbolically fed the whale with leaves of the roseroot plant, and gave it water to drink.